TEN-TEC Engineers have utilized state of the art, silicon MOSFET technology to create a continuous 100% dutycycle operations in both CW and SSB Modes. 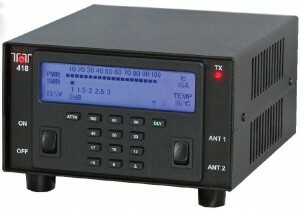 The Model 418 is also compliant with AM, FM, AFSK, and PSK modes of operation. Measuring only 3.625” x 6.5” x 7.6” inches and weighing just 5.4 lbs, the Model 418 will operate from any 13.8VDC (+/-15%), 20 Amp power source. Designed to interface with the new TEN-TEC Model 539 QRP Transceiver, the Model 418 amplifier can be easily connected to most low power transmitter designs (20 Watts or less input). The amplifier’s comprehensive User’s Manual and TEN-TEC’s industry standard Technical Support department make set up quick and easy. The Model 418 can switch bands automatically or manually. It also has a two position manual antenna switch. Bypass operation allows low power operation until higher power is needed. Don’t for get to send us your latest Shack Photographs and submit links to your club or community event for the community page. This is a great way to get some exposure for your organization or a community event station. The TEN-TEC SSB Net meeting frequency has changed to 7.260 LSB Sundays at 4PM Eastern Daylight Saving Time. This entry was posted in Announcements, Product Announcements, QRP and tagged Ten-Tec, Ten-Tec Announcements, Ten-Tec Model 418, Ten-Tec Model 418 100, TT Model 418. Bookmark the permalink.